If you have troubles using our Ready-made Templates (the ones that we’ve already designed with applied style and images) we invite you to try our Newsletter Template Editor and the Tailor-Made Templates module. In just a few clicks you will be able to create your Newsletter Template from scratch. You don’t need to have any knowledge of the HTML coding language. 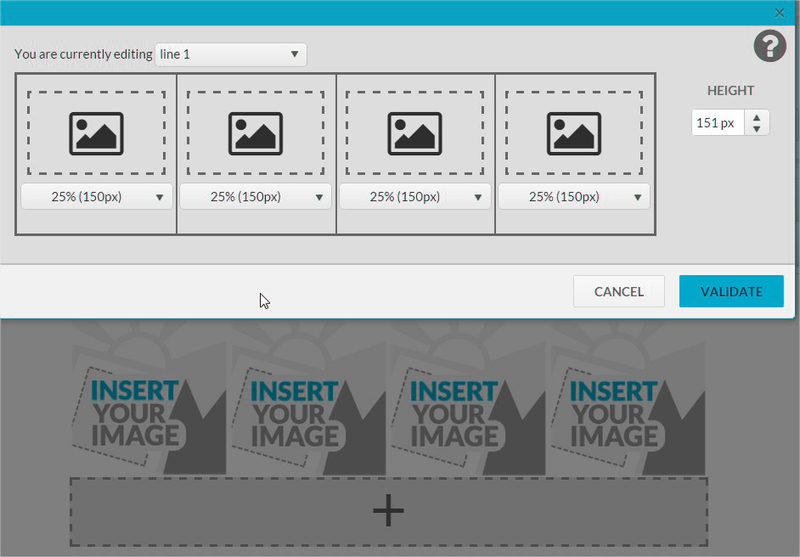 You can add and remove fields and lines, insert images and text fields, increase and decrease the size of the fields, etc. You can completely customize your own Newsletter Template! Adding and removing fields in our newsletter Editor works with a system of lines. Each line contains one, two, three or four fields. You can add up to 4 fields in each row of your newsletter Template. 1) While adding fields, select the type of content for each field (text, image or empty field). If you want to modify again the content in one of the lines of your Newsletter Template, click on the field and on the type of content you wish to insert. To change the height of a field, you have to increase the height of the whole row. The image height can vary between 50px and 300px. We set those limits for deliverability reasons, because email campaigns containing larger images are often blocked by spam filters of email providers. Concerning the size of the empty fields, the minimum height is 5px and the maximum height is 50px. If you want to add or increase the space between two lines, you can add an empty field or an empty line. Click on the line (and then on the pencil icon) or create a new line by clicking the + button at the bottom of your newsletter. For deleting a row in your newsletter template, simply click on the row and then the recycle bin icon that appears on the left. Each new line you create will appear on the bottom of your newsletter template. If you want to move the line up or down, simply click on the line and then on the arrow icon up or down. For customizing the colors of your Newsletter Template, check-out our article about editing and chosong colors of a Newsletter Template. If you don’t know how to procede for sending your newsletter to your subscribers, check-out our article : How to send a Newsletter or an Email Campaign.